I was just think that Postcard United wasn’t much different from Postcrossing except the clunkier website, when a couple of much more unusual cards arrived 🙂 Along with a few from travelling postcard pals and wandering family it’s been a proper global postal experience opening my letter box! Who knows what and where I might receive next! This entry was tagged Postcards, snail mail. Bookmark the permalink. Also, I sent 2 cards to Nassau. 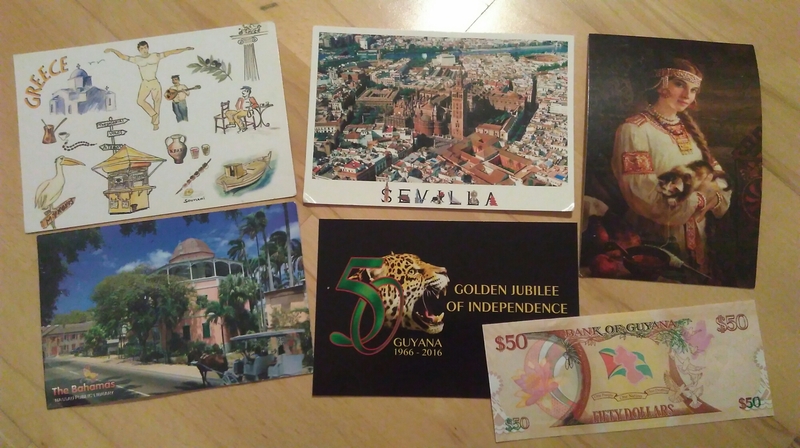 This is the other thing I learned: it seems there are only two Postcard Uniters in the Bahamas, and they are aunt & niece! So it’s safe to say I’ve had contact with your penpal in Bahamas. It’s a small Postcard United world!